...My fascination with the portrait began at age eleven I started to take drawing and painting lessons. 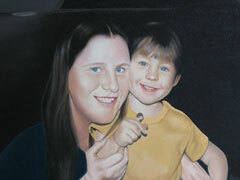 Through the years and with many painting courses, my painting skills developed. However it's under the guidance of the artist Irena Korosec (Bohemiarte School) that my painting techniques improved the most. 16" x 20" 20" x 16" 20" x 17"